First into battle and last out, the 95th, heroes of the Peninsular War. Meet the 95th Rifles when they are camped at West Stow and find out how our Baker rifles beat Napoleon. You can talk to a ‘chosen man’, try one of the famous green jackets or feel the weight of a Baker rifle. Drill and firing displays help bring our past to life. This is the most famous of all Wellington’s regiments from the Peninsular War and Waterloo (1803-1815). They have found a special place in the history of our military and as important to that story as Cromwell’s Ironsides or the Desert Rats. In modern times they have been featured in popular culture in Bernard Cornwell’s ‘Sharpe’ series of novels which were presented in the iconic television series of that name with Sean Bean as Richard Sharpe. 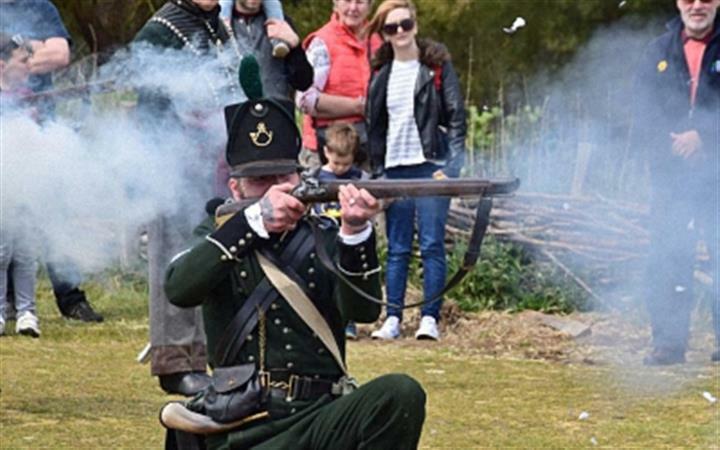 The 95th Rifles re-create the everyday lives of soldiers and camp followers during the Napoleonic wars. Sometimes fighting dramatic battles and skirmishes, sometimes training to fire our flintlock rifles, with local Brandon flints. Everything is done to historical accuracy, including general life around the period encampments.